An article that is stored in Enterprise and placed on the layout needs to be checked-out before it can be edited in InDesign. This unlocks the article for you but locks it for other users so that they cannot make any changes to the article until you have checked it in again. Choose Smart Connection > Check Out Article. Click the Check Out Article button in the Elements panel. 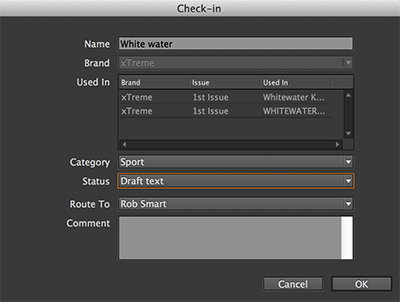 From the flyout menu of the Elements panel, choose Check Out Article. Right-click an article or article component in the Elements panel and choose Check Out Article from the context menu. Right-click the text frame on the layout and choose Check Out Article. To open all placed articles in one action, click the 'Check Out All Articles' button in the Elements panel. No articles or frames need to be selected for this to work. Two methods exist: with and without the Check-in dialog box appearing. Use this method if you want to change any of the properties of the article. Click the Check In Article... button in the Elements panel. Right-click an article or article component in the Elements panel and choose Check In Article... from the context menu. Step 3. (Optional) In the Name box, modify the article name or leave the original name. When multiple articles were selected, a Check-in dialog box for the next article is displayed until all articles are checked-in. Repeat steps 3 to 5 until no more dialog boxes appear. Use this method when you know that you don't want to change any of the properties of the article. During this process, the Check-in dialog box will not appear. This makes the process very quick, especially when checking-in multiple articles. Note: This process checks-in all articles that have been opened for editing; it is not possible to check-in individual articles while leaving others open for editing. Click the 'Check In All Articles' button in the Elements panel. No articles or frames need to be selected for this to work. This method is known as the 'abort check-out' action. It closes the article and returns it to the state it was in before it was checked-out. Choose Smart Connection > Abort Check Out Article. From the flyout menu of the Elements panel, choose Abort Check Out. Right-click an article or article component in the Elements panel and choose Abort Check Out from the context menu. Right-click the text frame on the layout and choose Abort Check Out. 22 October 2018: Updated section 'Method #1: Check-in using the Check-in dialog box' by adding information about invalid file name characters.